I am pleased to announce that my book, The History of Karate and The Masters Who Made It, is scheduled to be released in a few months. Below is what two highly respected karateka and a publisher have said about the book. Jim Pounds, President Seiwa Kai Texas: I’ve been reading through your book. I was expecting a dry treatise on martial history, yet it is anything but that. It is lively, highly readable, and utterly interesting. Great job! I anticipate this book will be a classic – the go-to book for understanding karatedo development. I know I will buy a copy. Charles Fink, M.Ed. School of Human Kinetics, Laurentian University: Sensei Mark Cramer’s writing is a perfect reflection of his training: methodical, thorough, and insightful. This no-nonsense and academic approach to karate’s history is a must read for any serious student of the martial arts. Penguin Random House: This first concise yet comprehensive history of traditional Okinawan and Japanese karate includes authoritative biographies of the great karate masters of the past and the philosophical issues they faced as karate changed and evolved. 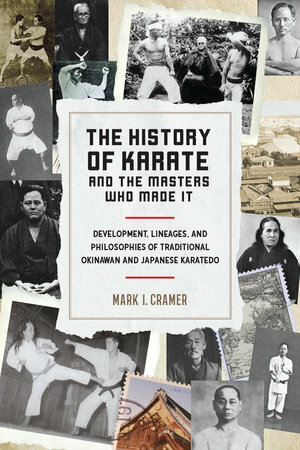 Bringing a fresh understanding to the study of the martial arts, Mark I. Cramer dispels many of the often-repeated martial arts myths as he details the lineages of the modern styles of karate and describes the social, cultural, and political events that influenced them. While most books focus on a single style of karate or the biography of just one of the great teachers, this book offers a well-researched and detailed overview.